2 Capel Gwyn in North Wales a perfect base for your holiday in Gwynedd. Find out more about 2 Capel Gwyn below. Able to sleep four with one double and one twin bedroom, this lovely little cottage comes with a well-equipped fitted kitchen and dining area which is reached through an arch from the snug sitting room with wood-burning stove. Close to the centre of the Snowdonia National Park, on the edge of the old slate quarrying village of Llan Ffestiniog, lies this delightful 19th century, stone-built, semi detached cottage. Situated with stunning views of the Moelwyn Mawr and Bach mountains, this property is set in a quiet residential lane for a peaceful vacation. Contemporary fixtures and fittings combine with cosy cottage atmosphere to make this property an incredibly welcoming home-from-home. Well situated for amenities in Llan Ffestiniog and Blaenau Ffestiniog, this cottage makes a great base for people looking to explore Wales. 2 Capel Gwyn is family friendly self catering. We have the following details listed regarding 2 Capel Gwyn accommodation accessibility but we would recommend that you always confirm these prior to booking with the owner or operator. 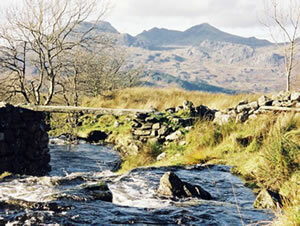 2 Capel Gwyn is a great base to explore the wonders of Gwynedd and you will find plenty of activities near by. 2 Capel Gwyn is at Llan Ffestiniog, Gwynedd LL41 4NP. Check out the map below for directions, use the controls to zoom in. If you have stayed at 2 Capel Gwyn why not add your thoughts, comments, pictures to our Facebook page? Don't forget to add the name/town/page link to your comment so its attributed to the correct place. Please keep it polite, we are sensitive souls! Find Cottage Holidays works closely with independent cottage owners and leading holiday travel operators to provide you the widest choice of self catering accommodation across Wales. 2 Capel Gwyn in Gwynedd is available through: Sykes Cottages. Stayed at 2 Capel Gwyn?